Whenever paying a visit to a Shinto jinja, it is customary to purify yourself at the Purification Font before advancing to the Hall of Worship to pray. 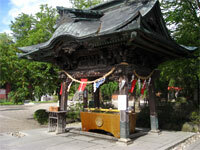 A shrine's purification font often is inscribed with characters meaning "cleanse your mind" ; there can be found a basin overflowing from a constantly flowing stream of pure water. This water is used to cleanse the hands, mouth, and mind prior to worship, allowing the individual to approach the deity in an unblemished condition. 1. Take the water dipper in your right hand, and pour water onto your left hand. 2. Take the water dipper in your left hand, and pour water onto your right hand. 3. Once more take the water dipper in your right hand, pour water into your cupped left hand, and rinse your mouth with the water from your hand (please do not drink directly from the dipper). 4. In consideration of the next visitor, raise the dipper vertically and rinse off the handle with fresh water, then replace the dipper in its original location.